For many urban dwellers who visit here for the first time it is hard to imagine but there was a time when Fish Springs was a critical stop on a number of pioneer pathways. Beginning in about 1858 with George Chorpenning's "Jackass Mail" station to the days to the John Thomas Ranch serving Lincoln Highway travellers, it was a vital stop in what was for early travelers, an enormously challenging passage. In the mid 19th century a common thread bound all of these west desert travellers to Fish Springs. The presence of abundant water and forage for horses in region that often had very little of either for great distances. George Chorpenning began his association with western Utah in 1851 when he ran a mail service from Salt Lake City to Sacramento. His original route ran north from Salt Lake through the Goose Creek Mts. and then down the Humboldt River. However, during the winter, he was forced to go south from Salt Lake along the old Spanish Trail to Los Angeles and the transport the mail by boat to Sacramento. Looking to reduce the very prohibitive costs these routes required, he looked to find a shorter all-weather route to California. This route would go from Camp Floyd, near the modern day community of Cedar Valley, over Lookout Pass and across the west desert via Simpson Springs, Dugway Pass, Fish Springs, Sand Pass, and Pleasant Valley and on the Steptoe Valley. Chorpenning would find that cost to move the mail would still exceed what the market would bear, and in 1860, he would lose the government mail contract to a group of upstarts headed by William Russell under the name of the Central Overland California and Pike's Peak Express Company. Most of us today know that business partnership by the shorter name of the Pony Express. The Pony Express began operation on April 3, 1860 and Fish Springs would be a major way station on the route between Fort Floyd and Ruby Valley. The Pony Express route would deviate from Chorpenning route at Fish Springs. Instead of going south and through Sand Pass, the riders would go north around the tip of the Fish Springs range and west through Callao, up Overland Canyon to Ibapah and then on to the Antelope Valley and across Rock Pass to rejoin Chorpenning route just east of Schell Creek. 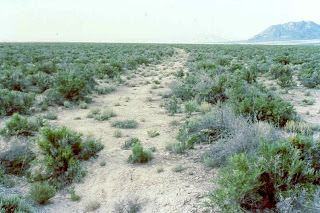 One can still see the recreated remains of Boyd station some 14 miles west of the Refuge. 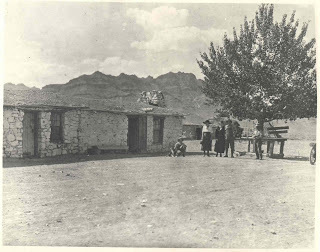 In Callao, Don and Beth Anderson of the Willow Springs Ranch maintain the station that was there and in Overland Canyon the recreated remains of Canyon station and the location of Burnt station are of interest The proprietors of the Pony Express, just as Chorpenning had ultimately found, would realize that even at the astounding fee of $5 per ounce, they could not make a profit. That fact, along with the completion of the transcontinental telegraph line, would be the death knell for the Pony Express venture. Most of the assets in the west desert associated with the Pony Express would be acquired by the Butterfield Overland Express Company. The Overland Express would not only get the mail contract but would begin the first scheduled stage service across this arid stretch. Noted travellers who travelled the stage on this route included Horace Greeley an Mark Twain. Greeley would record, after spending on overnight at the Fish Springs station, that "The muskeetoes feasted on our blood" and regarding his travel across Utah's west desert on the stage, Twain would write in Roughing It that "It was an experience calculated to undermine one's religious convictions"! The Overland Express would continue through 1869 when, much like the scenario that befell it's predecessor the Pony Express, the service would be made unprofitable by the completion of the transcontinental railroad. There would be continued stage service from Camp Floyd to Ibapah or Gold Hill for another 50 years but it would never see the popularity that it had during it's heyday. In the mid 1880s, John Thomas of Lehi would set up operations at Fish Springs to raise cattle and horses for the area mining interests. For Thomas this would provide a marginal existence for the next 25 or so years. In 1913, the nation would see the identification of the first guided transcontinental automobile route, the Lincoln Highway. This pioneer auto route would, surprisingly enough to most modern day travellers, be routed through Fish Springs. Henry Joy, President of the Packard Motor Company and one of the original founders of the Lincoln was the primary pathfinder for the route and upon reaching Salt Lake City was faced with the same dilemma that the early wagon pioneers faced. One either had to go north around the Great Salt Lake or south around the extensive salt flats. The route south around the salt flat was considerably shorter and in keeping the the guiding policy through the history of the Lincoln Highway, choosing the most direct route from New York to San Francisco, the route would go south and through Fish Springs. From Fish Springs, the original route would mirror the Pony Express route until it reached the Antelope Valley. Rock Pass was too rough for cars and the route would continue south through Tippett to the head of Spring Valley and then bend back north to meet up with the Pony Express route just east of Schellbourne Pass. Thomas would find the Lincoln Highway to be a very lucrative prospect. Traffic would begin toincrease through the west desert very quickly after the route was announced and a guide produced. In 1914, Thomas would have well over 400 vehicles stop at his ranch for fuel, food, lodging, or as was often the case, towing service from the terrible mud crossing the Fish Springs flat. By 1916 the traffic would increase to nearly 1700 vehicles. That might be more than pass through today! Thomas was famous for having developed one of the spring to flood the road to increase the frequency of his towing opportunities and kept a team of draft horses harnessed in his barn just for such "emergencies! The John Thomas Ranch during the Lincoln Highway era. In 1919, a shortcut would be built from Granite Mountain west and the route would bypass Fish Springs and Callao. This new route would continue west to Gold Hill and then would cut back south to join up with the original route at the head of Overland Canyon. However, this shortcut was not a road to be taken during much of the winter or during wet period and much of the traffic still came through the original route when road conditions were adverse. Modern day tourists still travel the county's Pony Express Road through Toole and Juab counties looking for an adventure. Most still find it and are many are much reassured when they finally reach the outpost of civilization that is the Refuge Headquarters and Visitor Center. They continue the pioneer spirit of the last 150 years albeit in modern air conditioned automobiles with steel belted tires and often with four-wheel drive! It's only four weeks until the first annual Snake Valley Festival, July 24-26. Plans are coming together for this fun-filled event that will raise money for the Great Basin Water Network to help protect the water and water-dependent resources in Snake Valley. The festival kicks off Friday, July 24 with a potluck dinner at the Garrison LDS Church. They provide their awesome Dutch-oven fried chicken and potatoes, and everyone is asked to bring a side dish or dessert. This is a laid-back, relaxed event. Often a volleyball game begins after dinner and kids race around the building. There is always so much food to choose from that it's hard to decide what to eat! Later in the evening you might like to catch a campfire program at Great Basin National Park. These are held nightly at the Upper Lehman Creek Campground. A park ranger gives a presentation about some aspect of the park near the campfire, while Lehman Creek flows nearby under the ponderosa pines. On Saturday, July 25, wake up and head to the pancake breakfast. This breakfast will be much more than pancakes, and it will be delicious, because Reita is heading it up, and she was the owner of The Outlaw in Baker for many years. She knows how to serve up a good meal. It will be held on the main street in Baker. At 10 a.m., a Pioneer Parade will run down the main street in Baker. This is small town living at its best. There will be a unique assortment of parade entries. When the parade reaches the end of the parade route, it will just turn around and go back through town so you will get a good view no matter where you are! After the parade it's time to check out the booths. Currently we have 14 booths registered, ranging from a yard sale, book sale, dunk tank, arts and crafts, and more. Entertainment, such as cowboy poetry and music, will be held at the Baker Hall, just a block off main street in the big pink building. This is also the site for the silent auction, which will run from 11-4. Kids games will be held outside during the afternoon. Hungry? Food booths will provide a variety of choices like pizza, hot dogs, sodas, and beer. It's hard to predict what the weather will be like in late July, but if the clouds don't come in to shade us in the afternoon, and you need a break from the heat, one option is to head about 30 miles north to Crystal Ball Cave near Gandy. This is a fantastic cave--it feels like you're walking inside a huge geode because the walls are covered with crystals. At six p.m., if you're not already at the Border Inn, it's time to go there for a scrumptious all-you-can-eat barbeque. There are several meat and salad choices available, and the smells from the barbeque make you want to lick your lips just anticipating the yummy food. At eight p.m. the dance starts, with the live band Most Wanted. This is a time-tested band and one of our favorites out here in Snake Valley. They play some really good dancing music. During breaks, a live auction will be held to help raise additional money. If your feet get tired from pounding the dance floor, you can take the opportunity to look up at the gorgeous night skies of Snake Valley. A night sky program will begin at Great Basin National Park at 8 p.m., but you can come anytime to look through the telescopes to see some distant objects in the immense universe. Generally the telescopes are left up until very late--sometimes all night long. The fun doesn't end on Saturday. Sunday morning there is a mountain bike ride at 7 a.m. Need to bike off some of those extra calories from the day before? Here's your chance. The ride starts in downtown Baker, goes up towards the mountain, and then circles back for a total of about ten miles. If you're not sure you want to ride uphill much, there will be an option to get dropped off near the top of the ride. How can you beat that?! The pancake breakfast will be held again, from 8 to 10 a.m. Make sure you fill up before you head off on the day's activities. Church services will be held at the LDS Church in Garrison at 9 a.m. and at the Baker Community Church at 10 a.m.
During the day, if you haven't already had the time to do so, visit some of the sights at Great Basin National Park like the bristlecone pines, rock glacier, subalpine lakes, Lehman Caves, and wonderful backcountry trails. In the evening there's another night sky program. Mark your calendars and plan on a great weekend, July 24-26! We hope to see you at the Snake Valley Festival. 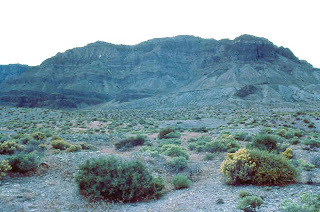 Snake Valley and the surrounding mountains are home to over 1,ooo plant species. The great diversity is largely due to a range of elevation that exceeds 8,000 feet from the valley bottom to the mountain tops. 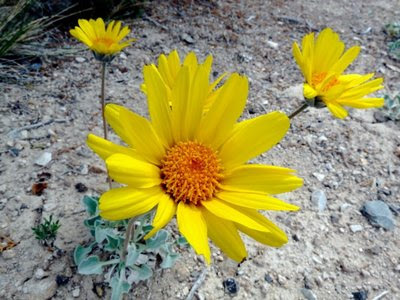 and Flora of the Snake Range, an online key that can help you figure out what plants you might be seeing. We have reached a critical time in the world of west desert breeding birds. 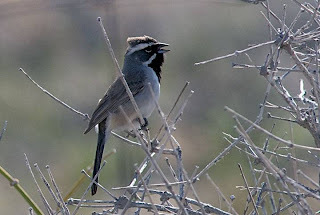 For those breeding species of birds who nest in the desert brushlands, rather that the lush wetland conditions found at places like Fish Springs, Gandy marsh, or near some of the irrigated hay fields, June is often make or break time. These birds, almost with out exception, produce young that are entirely dependent on insects for a food base during some or all of the brood rearing stages. 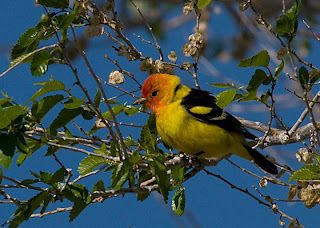 Many of these species may be predominantly vegetarian in their diet as adults, but a vegetarian diet simply can not provide the protein necessary to fuel the rapid growth that nestling require if they are to be successfully fledged. A steady flow of insects is critical, something that is not an easy task for those birds whose young are not mobile but are rather, confined to the nest until they are capable of flight. This would include nearly all of our song birds. Studies have shown that in most desert areas, and the Great Basin is no exception, that many insects species have hatching cycles that are tied to Spring or Summer rainfall events. Such rainfall occurrences typically fuel a concurrent flowering or vegetative growth surge among many of our native plants and there is no doubt that the insect hatches and these plant flowering and growth surges are close correlated. The plants often depend on a specific or just a few species of insects for pollination and the insects depend on the plants for the pollen or actual growth for a food source. So far this year, we have had a sequence of recurrent rainfall events that have been well spaced. I am hopeful that after two relatively poor years of avian production from the shrublands in our part of the world, we will see a great hatch with good survival to the wing this year. Last year, here at the Refuge, we had only 1.33" of rain from April 1 to late July when the monsoons finally brought some relief. In the last 10 days, we have been blessed with nearly an inch! If we can get just a few more storms to gift us with rain (It does not take much. 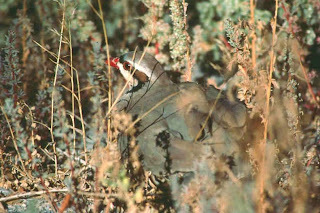 As little as .15" can do the job) it should prove a banner year for our dryland nesting birds! 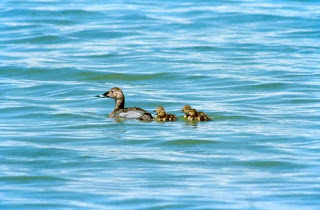 I always call June "the month of ducklings" here at the Refuge. The peak hatching of our waterfowl broods will occur during the month and it is a great time to travel our tour route to see the bright yellow balls of fluff! Our "no seeums" and mosquitos are doing quite well so bring your insect repellent! In a previous post, I talked about the Refuge preparing to celebrate our 50th birthday as a unit of the National Wildlife Refuge System. That event, held on May 8-10, was a tremendous success and I'd like to thank the hard work of the Refuge staff and an incredible cadre of Refuge volunteers that made it happen. I received a lot of favorable comments about the weekend and I am confident that those who were here probably learned something about the Refuge they did not know before they came for the event. A very well done article appeared in the Tooele Transcript-Bulletin and I will post the link in this blog. 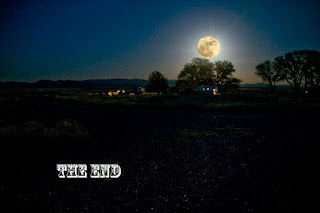 A big thanks to Refuge supporter Earl Nelson for many of the wonderful photos, including the full moon during our Refuge birthday celebration for this blog piece.